While cars driving into buildings is a relatively rare phenomenon today, prior to automobiles incidences of horses entering buildings were even rarer. Consequently, when they happened, they typically received some sort of notice. When Thomas Sisson's bay walked into the Middleborough Post Office which was then housed in the Peirce Block at the Four Corners on September 7, 1907, it not surprisingly created a considerable stir. Fortunately, James H. Creedon documented the now humorous episode for posterity. Clearly amused by the entire affair, Creedon made much of the incident, revealing in the process not only his ability as a correspondent but his skill as a humorist. Thomas Sisson's big gray horse, hitched to a heavy truck, was left standing on the street in front of the Middleboro postoffice today at 11.30 a. m., and when it saw people going in and out of Uncle Sam's depot decided that there ought to be something inside of interest to the equine world. The big bay, without any intimation of its wish to look over the stamp bureau, straightaway marched across the sidewalk and up the three steps to the floor of the postoffice. Immediately there was excitement on the street and in the office. The oldest resident, the postmaster and his assistants, the town constable and the guardian of the Peirce fund averred that in all their lives they had never known a horse to have called in person for his mail. They insisted it was proper for horses to get their mail and souvenir postal cards, especially Tom Sisson's big bay, by rural free delivery. The bay didn't take much notice of the excitement its appearance in the postoffice created. But before it could get to the stamp window or the general delivery pigeon hole, it was brought up short, not on all fours, exactly, but so surely that it wasn't permitted to conduct a personal interview with the salaried officials in the office. This interruption was due to the fact that the main entrance to the postoffice is a common every-day sort of single doorway. The big bay got mostly through, but when it came to the big truck there was trouble. The front gig, neither at an angle of 42 degrees or headon would pass through the portal. The horse shifted, side-stepped and squirmed, but could not get the wagon inside the door. The wheels braced against the doorposts and squeaked in remonstrance at the big bay's efforts to do the postoffice circuit. Fearing that it might pull the front of the postoffice through the store and out into the backyard it gave up the struggle and rested. Then the populace appreciated the humor of the situation. The horse didn't appreciate the humor of the situation now. The animal couldn't get in to find whether a letter had come from home with money in it or not; neither could it back out. The crowd got busy and finally the animal was unharnessed, and led into the vestibule. Strong men then rolled the big truck into the street. The bay blinked approvingly at these proceedings, and didn't offer a word of remonstrance, even when it was led quietly out of the door down the same three steps and back to the cart. The office suffered no material damage. 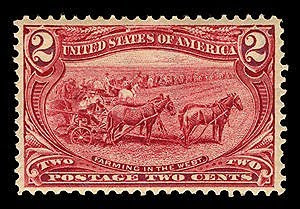 While the more traditional way for horses to enter U. S. post offices was through appearing on stamps such as this 1898 issue commemorating farming in the west, in 1907 Thomas Sisson's bay walked into the Middleborough post office and created a considerable stir. Source:Brockton Times, "Big Bay Walks Into Postoffice", September 7, 1907.